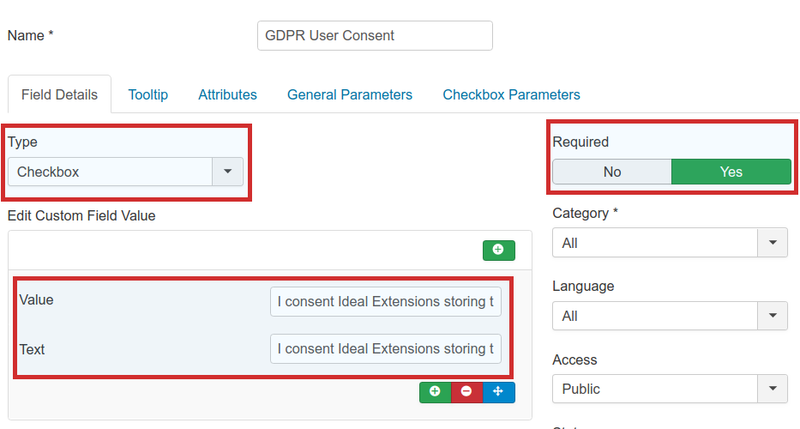 GDPR and Contact Enhanced Compliance - Ideal Extensions for Joomla! The General Data Protection Regulation (GDPR) (EU) 2016/679 is a regulation in EU law on data protection and privacy for all individuals within the European Union. It addresses the export of personal data outside the EU. The GDPR aims primarily to give control to citizens and residents over their personal data and to simplify the regulatory environment for international business by unifying the regulation within the EU. It was adopted on 27 April 2016. It becomes enforceable on 25 May 2018, after a two-year transition period. This is an an extensive description or list on how to comply with GDPR. For more information please read the official website. Request the explicit consent of every user before any data collection takes place. Requests must be in clear, plain, easily understandable language free of legalese. It also must stand alone from other matters or requests and not be buried in other text. Have a means for users to request access and view the data you have collected on them. Provide users with a way to withdraw consent and purge personal data collected on them; i.e. the “Right to Be Forgotten”. Penalization for noncompliance comes in the form of tiered fines that scale to the severity of the violation. Fines cap at 4% of annual turnover or €20 million, whichever is greater. A data subject is any EU citizen from which you are collecting personal data. GDPR compliance requires data subjects be granted certain rights. What follows is not an exhaustive list, but those rights that are relevant to the collection, processing, and storage of personal data on your website. Not all your forms are necessarily going to be impacted by the GDPR, as long as they are anonymous. In other words, if you’re not collecting personally identifiable information on users, your form’s not impacted. However most of your forms will collect name, email, phone numbers,... and GDPR will impact those forms. It’s actually not that hard to make your Contact Enhanced forms compliant. Let’s take a look at options. 1. Don't store any information. If you don't need to keep a record of any data from our forms, then simply don’t store/record the data (form submission). This eliminates any question of GDPR compliance with Contact Enhanced. Explicit consent has to be obtained before the form is submitted and any data collection can take place. You must notify the user that this form is collecting personal data with the intent to store that data. You’re also responsible for letting the user know how that data will be stored and used. a. Create a Checkbox Form Field and set to required. b. Configure Contact Enhanced to display the Checkbox for you. You are responsible to associate submitted data with the submitter. This will allow you to easily pull together submissions from a given user and either provide an export or delete them on request. You can also create a Contact Enhanced → Recorded Messages front-end Menu item, so your users can access their Messages and check for themselves which information you have on them. For example you can view your Recorded Messages on our website. If you don't need to keep Recorded Messages for a long period you can remove them periodically using the Contact Enhanced Cron Plugin (included in Contact Enhanced PRO package only). 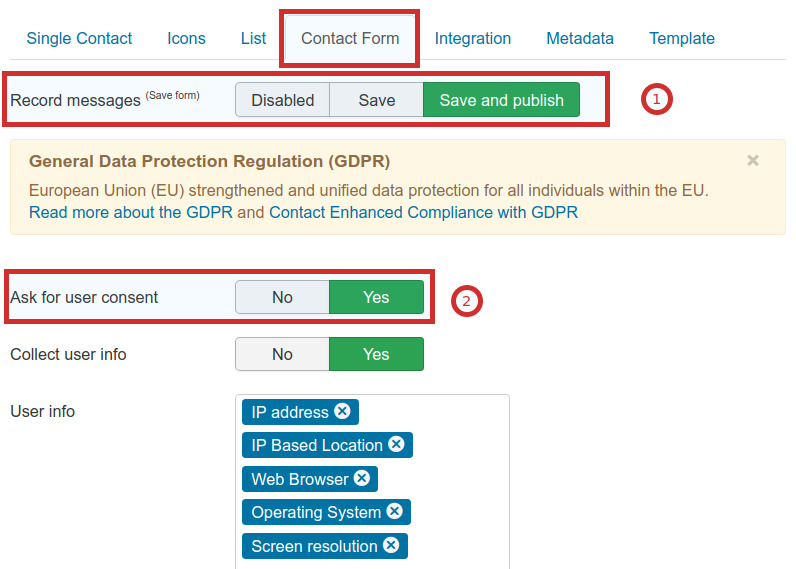 Contact Enhanced has the option to allow users to create a contact form them (if allowed by site Administrators), therefore we have to provide a way to easily export and remove contacts. In the plugin options you can choose whether you want to delete or remove the contacts when requested by users.